The fish finger sandwich has long been a national favourite – often slapped together with a dollop of ketchup, it’s easily prepped and always scoffed down a treat! Breadcrumb mix – the half slice of bread, teaspoon of coriander paste or fresh chopped coriander, teaspoon of chopped garlic (either paste or fresh), grated cheese – however much you prefer! Pop your 4 fish fingers in the oven at 200-230C (gas mark 6-7) or grill like normal – usually takes 10-15 minutes. Lightly toast your slice of bread, just so it’s a bit crispy and a little golden. Mash your avocado and spread onto the toast. 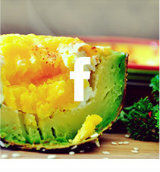 Once your fish fingers are nice and golden and you can hear the sizzle, take them out and place on top of the avocado. Pop on your sundried tomatoes. Sprinkle the breadcrumbs on top, grill until their golden, and voila! You have your very own ever-so-tasty Fish Finger Glamwich!